New virtual reality technology lets doctors see the insides of patients’ veins in 3D while they operate. Interventional radiologists use imaging to navigate through tiny blood vessels and precisely treat everything from clots to strokes to cancer and more. But the delicate, non-invasive procedures require them to use X-rays imaging to guide their tools throughout the procedures, exposing patients and themselves to radiation. A new catheter, developed at the University of Washington is decked out with electromagnetic sensors feeds real-time imaging from inside blood vessels to a virtual reality headset, making the procedures safer and more precise than ever before. 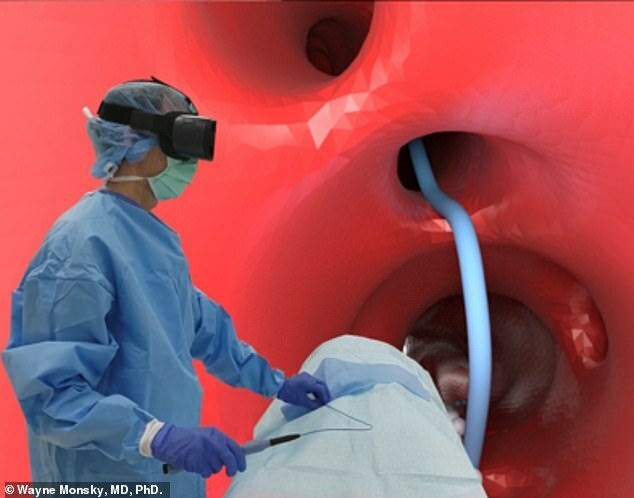 Virtual reality has generated a fair amount of excitement in the medical world, largely because it allows medical students or surgeons about to undertake complex procedures an opportunity to practice on something more responsive than a cadaver and less high-stakes than a living person. For radiologists, the trendy tech has a more direct application. Interventional radiologists use a thin flexible tube to guide tools through blood vessels and fix cardiovascular problems. Their pathway through the complex network of veins and arteries is plotted in 2-D images, typically via X-ray imaging displayed on giant screens in the special operating room. To make this possible, the X-ray machine has to remain on and over the patient’s body for the duration of the procedure. X-rays emit relatively low doses of radiation, but extended and repeated exposures can raise cancer risks. And radiologists are in the rooms designed for these procedures, called angiography suits for hours a day. They have to wear lead vests to protect their organs from radiation exposure, but that makes the hours doctors spend on their feet for the procedures even more grueling. Dr Wayne Monsky, a University of Washington interventional radiologist, knows exactly how difficult that is. ‘It’s an occupational hazard we all know of to be standing there wearing lead all day long,’ he says. Dr Monsky developed severe cervical spinal stenosis from doing so, and may eventually have to have surgery to relieve his back pain. But he may not always have to wear a lead vest to work, thanks to his own team’s invention. Electromagnetic sensors attached to catheters capture the size and shape of the blood vessels as the tool travels through them. This data is captured by VR software that renders it as a 3D image in the radiologist’s VR goggles. ‘Imagine being in Fantastic Voyage’ – the 1960s sci-fi movie about a team of scientists who are shrunk – ‘and how they traveled in the blood vessels of the body, and it was all around them – it’s like that,’ says Dr Monsky. ‘The beauty of this approach is it really puts you inside the body to visualize even the smallest parts. The technology itself is far smaller – consisting of just the special catheter and the VR goggles – eliminating the need for a special angiography suite, the X-ray machines and the giant screens. Plus, it’s far cheaper, and even portable. If it gets Food and Drug Administration approval, doctors could ‘use this technology to provide interventional radiology procedures away from big centers in big cities and out to rural and under-served areas,’ says Dr Monsky.